A process in operating systems uses different resources and uses resources in following way. Deadlock is a situation where a set of processes are blocked because each process is holding a resource and waiting for another resource acquired by some other process. Hold and Wait: A process is holding at least one resource and waiting for resources. No Preemption: A resource cannot be taken from a process unless the process releases the resource. 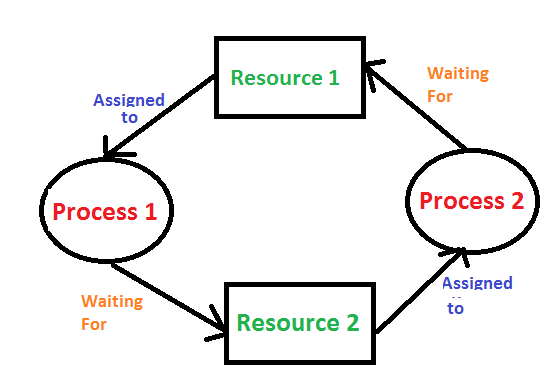 Circular Wait: A set of processes are waiting for each other in circular form. 1) Deadlock prevention or avoidance: The idea is to not let the system into deadlock state. 2) Deadlock detection and recovery: Let deadlock occur, then do preemption to handle it once occurred. 3) Ignore the problem all together: If deadlock is very rare, then let it happen and reboot the system. This is the approach that both Windows and UNIX take. See QUIZ ON DEADLOCK for more questions.